The Laurier Archives has added a wide range of convocation materials to its Digital Collection, available at http://images.ourontario.ca/Laurier/search. 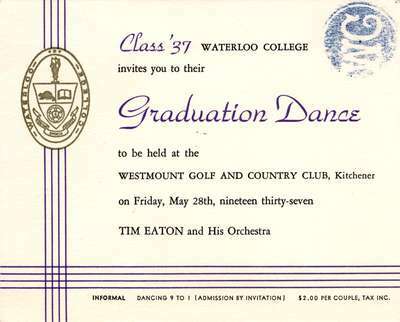 The collection of 439 documents, spanning 1921 to 2013, includes convocation programs, baccalaureate service programs, invitations, and dance cards. New records will be added to the collection after each future convocation period. “These new collections will be of great interest to Laurier alumni, as well as genealogists and people conducting research on family history,” said Laurier Archives Administrator Cindy Preece, who has been collecting and scanning materials for the new collection since 2010. The Archives’ Digital Collection contains over 12,000 images and textual records from the university’s archival and special collections. All records are completely searchable, and the collection is being expanded on an ongoing basis.